Last month, I wrote about IHG Rewards Club Book Direct-campaign for stays in Asia, Middle East & Africa (greater China excluded) between March 12 – December 31, 2018. IHG has now finally sent out emails to members about this offer (a reader forwarded it to us). Members can earn 1,000 bonus points for merely registering for this offer and up to 39,000 bonus points after three stays during the offer period. There is separate offer for up to 71,000 bonus points (read more here) that could be better for most (if eligible). I would assume that this offer is open for members that reside in the same area (Asia, Middle East & Africa and Greater China members excluded) where the stays must be to be eligible for the bonus points. IHG Rewards Club is here trying to get more people to book direct rather than using various OTAs that are popular in the area. This is an excellent way to extend the validity of family member’s points by 12 months that may be up to expire. 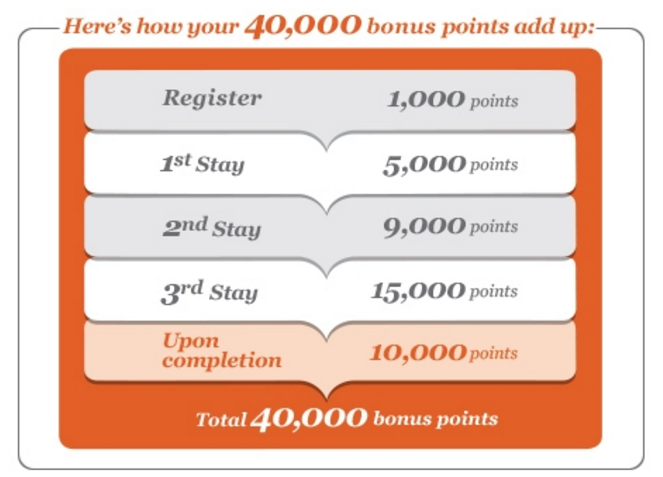 Some members had their points clawed back, IHG temporarily paused this offer for few days etc. Let’s hope that they have ironed out the issues for 2018. I was not able to register for this offer because I believe that you can only register for either this one or the other similar one that I also wrote last month (read more here and here). Must be an IHG® Rewards Club member before 11 March 2018. Offer is eligible only to members residing in Asia Pacific (excluding Mainland China, Hong Kong, Macau and Taiwan), the Middle East and Africa. This exclusive offer is valid for original recipient. Must register member number in advance to participate in this promotion. Members will receive bonus points upon registration and on completion of each of the first three Qualifying Stays booked directly on any IHG website or mobile site at InterContinental®, Crowne Plaza®, Hotel Indigo®, Holiday Inn®, Holiday Inn Express® and Staybridge Suites® hotels and resorts in Asia Pacific (excluding Mainland China, Hong Kong, Macau and Taiwan), the Middle East and Africa between 12 March and 31 December 2018 (“Registration”). The bonus points will be provided as follows: 1,000 points for registration; 5,000 points for the first Qualifying Stay; 9,000 points for the second Qualifying Stay; and 15,000 points for the third Qualifying Stay. Upon completion of all three (3) stays, members will receive 10,000 points as a bonus. A stay is defined per IHG® Rewards Club Membership Terms and Conditions as one night or consecutive nights at the same hotel, regardless of frequency of check-in/out (“Stay”). Additional Terms and Conditions specific to this promotion apply. A Stay constitutes a “Qualifying Stay” when member pays qualifying rates, which include most business and leisure rates at InterContinental®, Crowne Plaza®, Hotel Indigo®, Holiday Inn®, Holiday Inn Express®, Staybridge Suites®, of not less than USD$30. Bonus points are not issued for Non-Qualifying Room Rates or Non-Qualifying Stays. “Non-Qualifying Room Rates” or “Non-Qualifying Stay” include the following: net wholesale individual and group rate, certain package rates, employee discount rate, friends and family rate, crew rate, special discounted contract rates, seasonal worker/crew rate, 50% travel club discount rate, travel industry discount rate, distressed passenger rate, IHG® Rewards Club Reward Nights/Airline Hotel Reward rate, rates booked through third party web sites, complimentary hotel Stays and any other rates not defined as a Qualifying Room Rate at IHG’s sole discretion. Only one room per member per Qualifying Stay will be awarded the applicable bonus points. All bookings and stays are to be completed during promotion period between 12 March and 31 December 2018. No retroactive points will be awarded for stays prior to Registration. Rates are per room, per night and are subject to availability. Blackout dates apply. This Promotion is subject to standard IHG® Rewards Club Membership Terms and Conditions and earning structure, which can be obtained by visiting www.ihgrewardsclub.com. Other promotional terms and conditions apply. This exclusive offer is valid for original recipient only and cannot be combined with other promotions. Except as otherwise stated in the terms and conditions, please allow up to 2 to 3 weeks for bonus points to be credited after checkout. IHG reserves the right to remove a member’s bonus points or cancel a member’s account if fraudulent use of the Promotion is detected. IHG® Rewards Club reserves the right to cancel, suspend and/or modify the Promotion at any time with or without notice. Members must make any promotional inquiries by 60 days from the end of the campaign promotional period.